The set-up was as follows: Cage recited stories, plucked randomly from 90 stories written on cue cards, as David Tudor – playing out of earshot in another room – mashed sections of Cage’s Concert for Piano and Orchestra inside his electronic Fontana Mix. Cage’s stories – about Zen Buddhism, taking composition lessons with Schoenberg, his love of mushrooms and generally finding sublime pleasures in life’s minutiae – were overlaid onto Tudor’s bitty, non-sequitur boom-splats of music. All life was there – the fascination of boredom, banality collaps- ing towards whimsy, the curious randomness of accuracy working against/with the even stranger accuracy of randomness. Humour and existentialist melancholy co-existed, perching on a knife-edge. Cage imposed one further rule: each story had to slot inside a one-minute timeframe and therefore longer stories needed to be read quickly, while shorter stories were stretched to a counter- intuitive snail’s pace. But few stories actually spanned the one-minute duration comfort- ably. Cage played tricks with time. Only in the real world do minutes last sixty seconds. Even if they don’t. Or do. 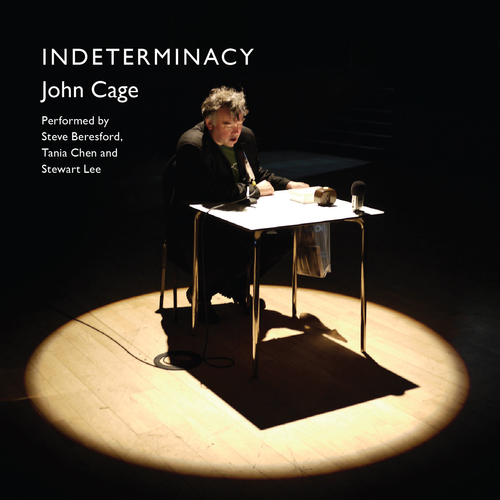 On July 2 and July 3 pianists Tania Chen and Steve Beresford will perform Indeterminacy live in St Leonard’s Church Shoreditch, with stand-up comedian and writer Stewart Lee taking the John Cage role.They will then take it to other venues around the country. It’s a historic event: as far as anyone can vouch, this will be the first performance of Indeterminacy since Cage and Tudor’s recording.And how about this for an act of Cageian randomness – as Beresford and Chen were pondering how to realise Indeterminacy live, Peters Edition, Cage’s publisher, unaware of their plans, published Indeterminacy:The Gift Box-set. Beresford again: “That’s the Cageian spirit. In the original recording, the constant slowing and speeding up of the voice is very funny, even if not laugh-aloud funny necessarily. But even funnier are when the punch lines, such as they are, get obscured by a sudden outburst fromTudor.” Chen:“Surreal... absurd? What’s the word?” “There is no word for it, which is why it’s worth doing,” Beresford counters. An episode of Lee’s recent BBC 2 Comedy Vehicle climaxed with a routine about Only Fools And Horses’ Derek Trotter – aka Del Boy – falling over in a wine bar.The joke was forensically dissected, as Lee repeated Del Boy’s lines reductio ad absurdum and re-created his slapstick fall again.And again. And again and again. And again. And again, once more.Voted Britain’s favourite comedy moment, Lee killed the joke stone dead. His message: falling over is an easy way to make comedy. “I immediately grasped Cage’s ideas about things being boring,” Lee tells me.“He talked about repeating boring things until they become interesting and writing comedy can be like that; if something doesn’t work over 30 seconds, it could well work over a minute. I performed that Del Boy sketch on tour, working with the material every night to make it spontaneous. But when I recorded it for TV, it had lost a certain edge.